Cast iron undermount vs apron stainless steel kitchen sink – comparison chart. Available in different sizes. Farmhouse stainless steel kitchen sink is a great choice for country style kitchen design. Available in different dimensions. Typically made round or square shapes. Ceramic bathroom vanity sinks normally manufactured in white color. Undermount kitchen sink is a good option for any kitchen decor with solid surface countertops. 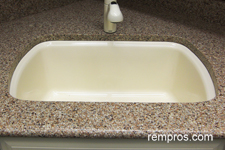 Apron sink is a great choice for stone or concrete counters. Normally base cabinet should be custom made for accommodating apron sink. Depends on finish quality. Normally cast iron sinks are resistant to dents. Depends on steel gauge. 18-gauge steel kitchen sink is more resistant to dents compare to sink made from 22-gauge steel. Quality enamel coating of cast iron sink is heat resistant. Stainless steel kitchen sink has excellent stain resistant properties. 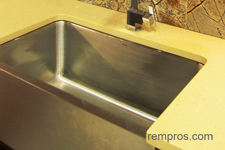 Enamel coating protects sink from corrosion, but if finishing layer is damaged sink can easily rust. Enameled cast iron kitchen sink is durable, but can be chipped. Stainless steel kitchen sink has excellent durability qualities. Undermount cast iron sink can easily last over 30 years. Life expectancy of stainless steel apron kitchen sink normally 35+ years. Require very little maintenance, but without adequate care can be easily scratched or damaged. Stainless steel is low maintenance material. Greatly vary. Some kitchen sink producers offer limited lifetime manufactured warranty. Depends on dimensions. Double bowl 33” x 22” x 9.5” cast iron undecounter kitchen sink with enamel finish weight about 130 lbs (59 kg). Depends on sink size and steel gauge. 16–gauge 36x21x10 stainless steel farmhouse kitchen sink weight approximately 78 lb (35 kg). Depends on brand, sink size and quality. Some cast iron kitchen sinks are very affordable while others could be quite expensive. Prices very greatly. Many stainless steel apron kitchen sinks are in the same price rage as quality undermont cast iron sinks. Charges to install undermount cast iron sink normally higher in comparison with securing apron front stainless steel sink. Cast iron undermount kitchen sink installation is relatively easy task, but due to sink weight it is normally not a one man task. Installation of apron stainless steel sink is not a hard project. About 25 minutes for an experienced installer with a helper not accounting kitchen faucet installation. Typically less than half an hour. Depends on damage, but repairing stainless steel apron kitchen sink could be a difficult task. Cast iron undermout and stainless steel farmhouse kitchen sinks have their own advantages and drawbacks. Apron stainless steel sinks are good choice for country kitchen designs, while cast iron undermount is a good match with nearly any kitchen décor. With very similar cost it is hard to say which one is better and often it is a matter of a taste which kitchen sink to purchase.